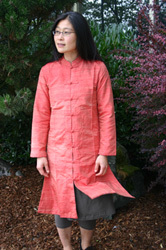 Marigold fair trade clothing offers Valentine’s gifts grounded in love and trust! Valentine’s Day: What does it represent to you; how do you show love? Show you care today and receive a 20% discount all things Pink and Red! Many people who encounter our products say that the fabrics carry energy within them. Feel sweet all over in our beautifully handcrafted products, made from women who are working in safe conditions, making a fair wage. Marigold Jacket, Bring with you joyful color and the sophistication of Marigold’s merlot Jacket this spring! This lightweight 3/4 -length jacket features secure knot closures allowing it to be worn as a dress or topping off a layered. Persimmon Yoga Hoodie, Constructed with ultra-fine, organic cotton knit, our Tadasana Hoodie provides a soft, breathable layer of warmth for yoga, shopping, walking or curling up with a steaming mug of chai. 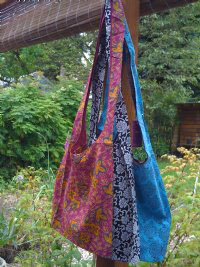 Fuchsia Reversible Bag, Style, color and function meet in our bag in Fuchsia these completely reversible bags will serve you well as purse, grocery tote, school bag and more. Pink Cheala Top, Searching for your new favorite spring go-to top? The search is over with the Cheala top, now with long sleeves. Made for your active lifestyle, this top takes you from running around town to an evening out. Flattering A-line silhouette, fluid hemline and soft organic cotton jersey with sleeves cropped just enough to show off your favorite bangle or cuff. Don’t forget the leggings! Pink is perfect for spring, ware them on Valentines Day and Easter. You’ll want a pair in every color for yoga, as an added layer of warmth, or simply pair them with our tunics and dresses. Crafted in soft organic cotton with a touch of lycra. Elastic waistband provides comfort and easy movement. Length on leggings for Size S and M is 31″ , Size L 32″ for XL 34″. Flowers wilt, chocolates get eaten and gems lose their shininess in time. What remains in our minds and hearts are the memories of how we show love that make us come alive. It is a powerful statement when a person chooses to buy fair trade and vote with their dollars. Happy Valentines thank you for supporting fair trade!